Mike and Cheryl, our couchsurfing hosts here in Albuquerque, live on the eastern part of the city that borders the Sandia mountain range. 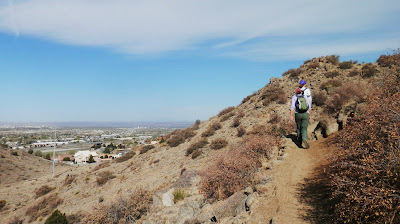 We were looking forward to a hike yesterday morning, and Cheryl took us out for an hour and a half in the foothills behind their home. We were originally planning on hiking to an airplane crash site in these mountains. TWA flight 260 crashed here in February of 1955 killing all 16 people aboard. Much of the wreckage remains and it's supposed to be a really interesting hike. But in researching the plan, we realized that it was a 6 to 7 hour hike round trip and so we're going to come back to do this another time. Ruth and Cheryl, leading the way on a beautiful morning in the foothills of the Sandia Mountains east of Albuquerque. Kevin and Ruth overlooking the city of Albuquerque. Lots of trails. Things sure are dry though. Even the cactus are showing signs of extreme thirst! Cheryl and Ruth back at the house. Just in time because we had a busy day ahead of us! The plan was to head to the downtown are first, wander around there and then head to what they call "old town" which is where the city first began. Then, we would go to the Albuquerque RattleSnake Museum and then the Aquarium and Botanic Garden. That should make for a pretty full afternoon. There's not really a lot to see in the "new" downtown area. We found a lot of government structures and parking lots. Although, there are two new courthouse buildings (one not totally completed yet) that are attractive buildings and worth having a look at from an architectural point of view. Not completed, so we didn't bother taking pictures. Mingling with some of the locals downtown! An interesting building. But, at 1:00pm on a beautiful day there was hardly anybody outside enjoying it! This observance was something that stuck with us for the rest of the day. An electric car charging station, right downtown! Hopefully this is only the start and we'll be seeing a lot more of this in the coming years. Our favorite part of downtown Albuquerque? Central Avenue, which is part of the famous old Route 66. Lots of interesting buildings, shops, and restaurants. And of course the classic Kimo Theater! The Kimo Theater in Albuquerque. Oddly enough, the Kimo Theater has a special showing on the next couple of Thursdays of Mexican movies made in the 1950's. They are shown in Spanish, with English subtitles. And it's free! Mexico had a thriving movie industry back then and a lot of big stars. We would have liked to have gone to see one of those movies, but by Thursday we will be in Denver, Colorado! From there, we went back to the little blue car and drove the mile and half to "old town". You know us, we would have walked it but we had too much to see! Historic "old town" Albuquerque has an beautiful old church that has served the community without interruption since 1706. Nicely restored church in "old town". The facade and towers are well done, but when we entered the interior and saw that they had added air conditioning...not too impressed. Here's Reggie, willing to sell you anything related to a hot air balloon! We were due for a break so we sat in the plaza in old town. This was similar to any little plaza in many of the towns in Mexico...lots of trees, places to sit, and a central gazebo. Very nice. Except, once again...there was nobody around. had this been Mexico, there would be people chatting, children playing, vendors selling. It is so strange how the culture changes as soon as you cross the border. We enjoyed the old adobe buildings. Hmm. Ladies shoes nailed to a post outside a house. Interesting. And then it was back to Mike and Cheryl's place just in time for dinner. The ladies made a great dinner for us, and then it was time for bed. Another busy day in Albuquerque is planned for today! An old International Harvester pickup truck looking much like it would have 50 years ago!! Lots to see there in Albuquerque , thanks for taking us along. It sounds like you had a very busy day. I would love to go there one day. The city and the surrounding area is a definite must see, Karen and Al. We really enjoyed our 14 days in Albuquerque too. Lots of history. We did miss the Rattlesnake museum though. Next time. I can understand the needing to stay 14 days. There is really a lot to see expecially when you include the surrounding area. Make sure you do see the museum the next time around, it was very interesting. Was everybody working? Is that why they weren't out enjoying the day? Not even at lunchtime. That seems kind if sad. We really enjoyed the old town section. You sure do pack your days full. That's what I said to Kevin but it was lunch hour when we were wandering around that area, so we just weren't sure where the people were. The Old Town was certainly more busy as there were quite a few tourists around that area. Our son got married on the tram going to the top of the Sandia Mountains. Then the reception was held up at the top. Beautiful views from up there. Everything is definitely looking dry. Hopefully some of our rain will head over that way. We would have loved to have gone on the tram but it was closed for maintenance from April 1-12th. We will miss it by two days. We were also going to drive up there today but it wasn't nice weather and we wouldn't have seen a thing, so it will have to wait for another visit. Glad you got to see a bit of Albuquerque, and we're glad you got to stay with us, we've enjoyed having you as guests. Your post brought back many happy memories of Albuquerque. It's a fun city to visit and we loved attending the balloon fiesta. Enjoy! We think it would be pretty amazing to be here for the balloon fiesta. Maybe one year we will make it! Looks just like the 1949 International pickup that I used to have. Yep, culture shock. Most Americans prefer to sit in the house. When we go to San Antonio I always suggest we go for a walk or go walk downtown. The answer is, "it's too dangerous, too many nuts". Go figure. It would drive me crazy to spend that much time indoors. When I was working, I always went out for a walk at lunch even in the middle of winter. Lol, nope we sure don't!